We are hitting September and that means gearing for the wedding season. Right from booking your makeup artist to sticking to the diet and searching the latest trends, a Bride-to-be always has her hands full. So here is a list to make your life simple when it comes to makeup. I have listed the Top 10 makeup products you need to have in your vanity that will be of utmost use pre and post the wedding celebrations. 1. Primer: This is your first product that will stick by you. I say stick, as a primer will help your makeup last through the day. The days approaching and post the wedding seem so packed that there is hardly any time for constantly touching up your makeup. The primer keeps the natural oils at bay and that makeup should last from Day to Night. TIP: Invest in a hydrating primer to make dull skin look supple. 2. Foundation: While you may have a huge choice from liquids to creams and powders, I would recommend trying these way in advance so you can see what you comfortable with as per your needs. However for a bride to be I would recommend a Liquid foundation that would let you adjust the coverage as per your need. TIP: Mix the same foundation with your daily moisturizer for a light coverage and voila you have a tinted moisturizer for the day. 3. 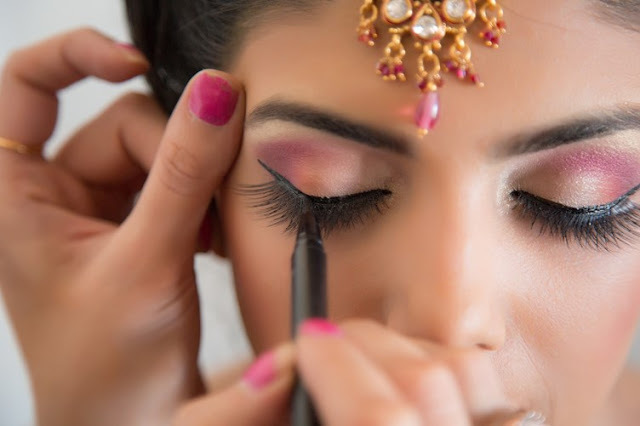 Concealer: Late nights, lots of Daaru Shaaru is part of the party and we don''t expect the Bride to be a party pooper. So have fun and also have a good concealer! I completely trust MAC concealers for Indian Skintones. 4. Compact powder: Always remember the key to long lasting makeup is setting the makeup in the first place so keep that powder handy always. A compact powder is a must have in every brides bag. 5. Kajal: Call yourself an Indian bride and to not have a Kajal in the vanity? That is not possible as this was most probably the first makeup item you ever bought. 6. Blush: We all love a blushing bride:) Keep a mix of a peach and pink shade handy. 7. Liquid Lipstick: Super easy to apply and super long lasting, the new trend of liquid lipsticks is here to stay with every brand releasing more and more colors. Try to get your hands on the Huda Beauty Liquid lipsticks but also back home Chambor and Revlon have some great options. 8. Mascara: Flirting with the groom wouldn't be fun without fluttering those lashes. Keep the waterproof one handy if you know there are going to be some emotional moments.